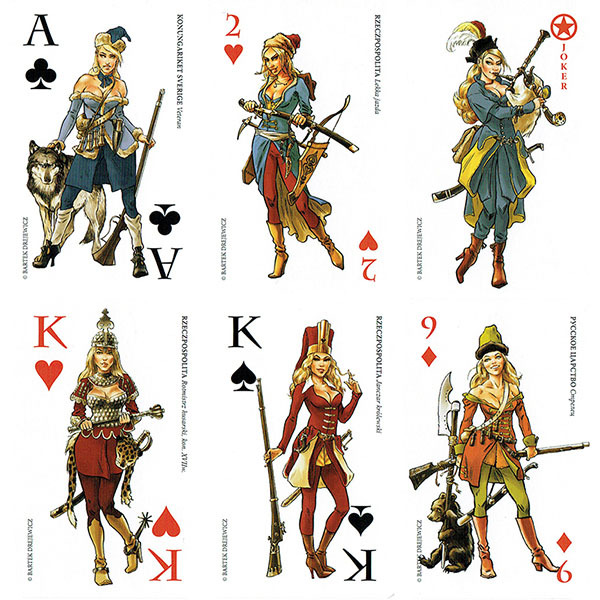 Fighting 15s’ initial stocks of 17th century pin-up playing cards by Bartek have run out – but don’t panic, because a new delivery arrived today. The state of the pound against the Polish zloty and the need to make a distributorship margin now that Colonel Bill’s takes the cards to UK wargames shows on Fighting 15s’ behalf mean that the price has risen to £12 inc VAT per deck. Fighting 15s still offers the chance to make a saving on a red-backed and blue-backed deck bought together: a pair costs £23 including VAT. Bartek’s Napoleonic deck is still out of print. He is slowly working on an entirely new Napoleonic deck, which sales of the 17th century deck will fund.